a. Chairman of the Supreme Revolutionary Council from 1969–1976 & after 1980. 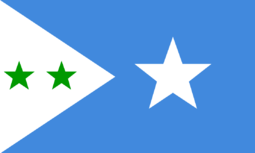 The Somali Democratic Republic (Somali: Jamhuuriyadda Dimuqraadiya Soomaaliya, Arabic: الجمهورية الديمقراطية الصومالية‎‎ al-Jumhūrīyah ad-Dīmuqrāṭīyah aṣ-Ṣūmālīyah, Italian: Repubblica Democratica Somala) was the name that the Marxist–Leninist government of former President of Somalia Major General Mohamed Siad Barre gave to Somalia during its reign, after having seized power in a bloodless 1969 coup d'état. The putsch came a few days after the assassination of Abdirashid Ali Sharmarke, the nation's second President, by one of his own bodyguards. 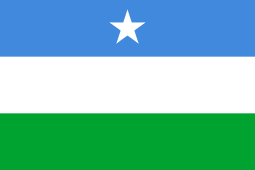 Barre's administration would rule Somalia for the following 21 years, until the outbreak of the civil war in 1991. Siad Barre with Romanian President Nicolae Ceauşescu in 1976. Alongside Barre, the Supreme Revolutionary Council (SRC) that assumed power after President Sharmarke's assassination was led by Lieutenant Colonel Salaad Gabeyre Kediye and Chief of Police Jama Korshel. Kediye officially held the title of "Father of the Revolution," and Barre shortly afterwards became the head of the SRC. The SRC subsequently arrested members of the former civilian government, banned political parties, dissolved the parliament and the Supreme Court, and suspended the constitution. In July 1976, Barre's SRC disbanded itself and established in its place the Somali Revolutionary Socialist Party (SRSP), a one-party government based on scientific socialism and Islamic tenets. The SRSP was an attempt to reconcile the official state ideology with the official state religion by adapting Marxist precepts to local circumstances. Emphasis was placed on the Muslim principles of social progress, equality and justice, which the government argued formed the core of scientific socialism and its own accent on self-sufficiency, public participation and popular control, as well as direct ownership of the means of production. While the SRSP encouraged private investment on a limited scale, the administration's overall direction was essentially socialist. 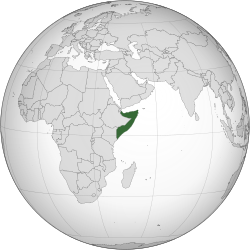 In July 1977, the Ogaden War against Ethiopia broke out after Barre's government sought to incorporate the predominantly Somali-inhabited Ogaden region into a Pan-Somali Greater Somalia. In the first week of the conflict, Somali armed forces took southern and central Ogaden and for most of the war, the Somali army scored continuous victories on the Ethiopian army and followed them as far as Sidamo. By September 1977, Somalia controlled 90% of the Ogaden and captured strategic cities such as Jijiga and put heavy pressure on Dire Dawa, threatening the train route from the latter city to Djibouti. After the siege of Harar, a massive unprecedented Soviet intervention consisting of 20,000 Cuban forces and several thousand Soviet advisers came to the aid of Ethiopia's communist Derg regime. By 1978, the Somali troops were ultimately pushed out of the Ogaden. This shift in support by the Soviet Union motivated the Barre government to seek allies elsewhere. It eventually settled on the Soviet Union's Cold War arch-rival, the United States, which had been courting the Somali government for some time. All in all, Somalia's initial friendship with the Soviet Union and later partnership with the United States enabled it to build the largest army in Africa. After fallout from the unsuccessful Ogaden campaign, Barre's administration began arresting government and military officials under suspicion of participation in the abortive 1978 coup d'état. Most of the people who had allegedly helped plot the putsch were summarily executed. However, several officials managed to escape abroad and started to form the first of various dissident groups dedicated to ousting Barre's regime by force. A new constitution was promulgated in 1979 under which elections for a People's Assembly were held. However, Barre's Somali Revolutionary Socialist Party politburo continued to rule. In October 1980, the SRSP was disbanded, and the Supreme Revolutionary Council was re-established in its place. By that time, Barre's government had become increasingly unpopular. Many Somalis had become disillusioned with life under military dictatorship. The regime was weakened further in the 1980s as the Cold War drew to a close and Somalia's strategic importance was diminished. The government became increasingly totalitarian, and resistance movements, supported by Ethiopia, sprang up across the country, eventually leading to the Somali Civil War. Among the militia groups were the Somali Salvation Democratic Front (SSDF), United Somali Congress (USC), Somali National Movement (SNM) and the Somali Patriotic Movement (SPM), together with the non-violent political oppositions of the Somali Democratic Movement (SDM), the Somali Democratic Alliance (SDA) and the Somali Manifesto Group (SMG). 1 2 The Encyclopedia Americana: complete in thirty volumes. Skin to Sumac, Volume 25, (Grolier: 1995), p.214. 1 2 Moshe Y. Sachs, Worldmark Encyclopedia of the Nations, Volume 2, (Worldmark Press: 1988), p.290. ↑ Metz, Helen C. (ed.) (1992), "Coup d'Etat", Somalia: A Country Study, Washington, D.C.: Library of Congress, retrieved October 21, 2009 . 1 2 3 Peter John de la Fosse Wiles, The New Communist Third World: an essay in political economy, (Taylor & Francis: 1982), p.279. ↑ Benjamin Frankel, The Cold War, 1945-1991: Leaders and other important figures in the Soviet Union, Eastern Europe, China, and the Third World, (Gale Research: 1992), p.306. ↑ Oliver Ramsbotham, Tom Woodhouse, Encyclopedia of international peacekeeping operations, (ABC-CLIO: 1999), p.222. ↑ Ahmed III, Abdul. "Brothers in Arms Part I" (PDF). WardheerNews. Retrieved February 28, 2012.
la Fosse Wiles, Peter John de (1982). The New Communist Third World: An Essay in Political Economy. Taylor & Francis. p. 392. ISBN 0-7099-2709-6.